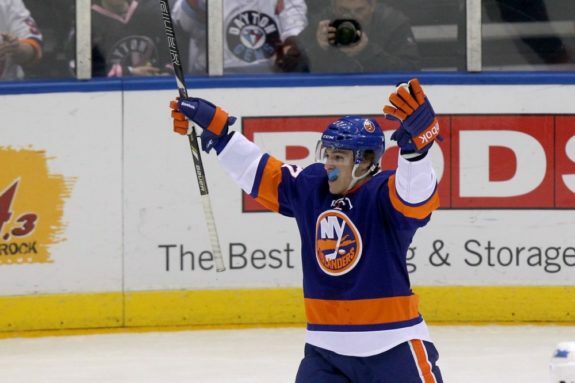 On April 7, during the last game of the season, Anders Lee scored his 40th goal becoming the first New York Islander to reach that milestone since the 2006-07 season. He joined an exclusive club as one of only 12 players to accomplish this feat while wearing an Islander uniform. The other 11 Islanders on that list include Stanley Cup winners, Hall-of-Famers, and a handful of one-and-done 40-goal scorers which hopefully, Lee will not be. There is skepticism about his ability to reach that milestone again now that John Tavares is no longer his center. That pessimistic view discounts the passing skills of teammates Josh Bailey and Mathew Barzal, who will both be around to feed Lee, and it discredits Lee’s proven ability to deflect or gather in and shoot pucks while planted in his favorite spot in front of the net. Lee is now a permanent member of the Islanders’ 40-goal club. Here is a look at the company he is joining. Jason Blake was the last Islander to make this list with his 40-goal, 69-point performance in 2006-07. He came over to the Islanders in a 2001 trade with the Los Angeles Kings. He started out in a checking role but quickly showed his offensive ability with three 20-plus goal seasons for the Islanders leading up to his 40-goal performance. He was never able to replicate it but he did go on to have two more 20-goal seasons with the Toronto Maple Leafs before his playing days ended. 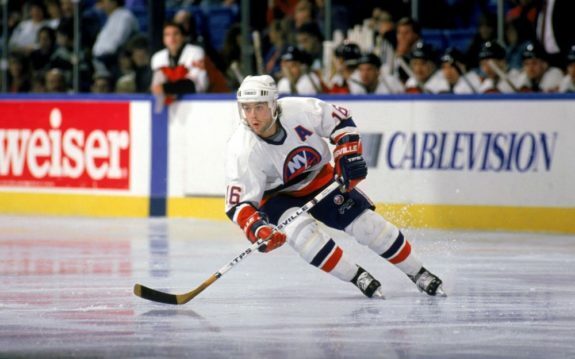 Steve Thomas played for six different teams during his NHL career but the Islanders were fortunate to have him during his peak years from ages 28 to 31. He scored 118 of his 421 career goals in four seasons with the Islanders including 42 goals in 1993-94. It was the second 40-goal season of his career. Thomas also scored 40 goals in 1989-90 while playing for the Chicago Blackhawks. Pierre Turgeon scored 40 goals during the 1991-92 season but that is not why he is on this list. 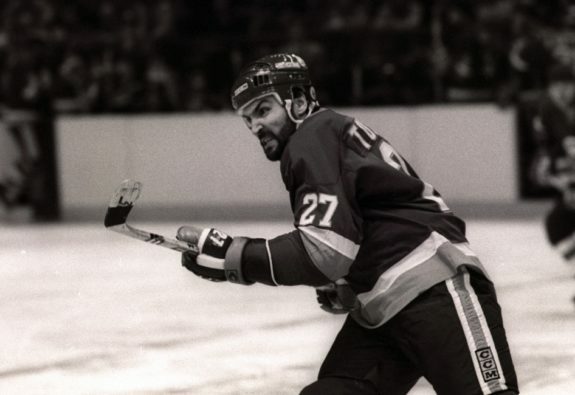 Turgeon started that season with the Buffalo Sabres where he scored his first two goals before an October trade to the Islanders where he scored another 38 goals. He qualifies for this list because of his career-high 58-goal, 132-point performance in 1992-93. He also took home the Lady Byng Trophy that year. Overall, 147 of his 515 career goals were scored during his four years with the Islanders. Ray Ferraro’s story is similar to that of Thomas. After seven years with the Hartford Whalers, including a 41-goal performance in 1988-89, Ferraro was traded to the Islanders where he turned in a career-best, 80-point season in 1991-92 including 40 goals and 40 assists. He went on to play with four other teams after leaving the Islanders via free agency in 1995 but never came close to the 40-goal mark again. Derek King joined the 40-goal club the same year as Ferraro when he also had the best season of his career with a 40-goal, 78-point performance in 1991-92. Although we don’t often hear much about King, he scored 211 goals during 11 seasons with the Islanders, good for tenth on the club’s all-time goal-scoring list. After five trips to the Stanley Cup Final with the Islanders between 1980 and 1984, John Tonelli had the best regular season of his career in 1984-85 with 42 goals and 58 assists for his one and only 40-goal, 100-point season. He had been a 30-goal scorer four other times in his career; twice with Islanders and twice while playing for the Los Angeles Kings. Brent Sutter matched Tonelli’s 42 goals in the 1984-85 season and added 60 assists for 102 points in what would be his only 40-goal, 100-point season. 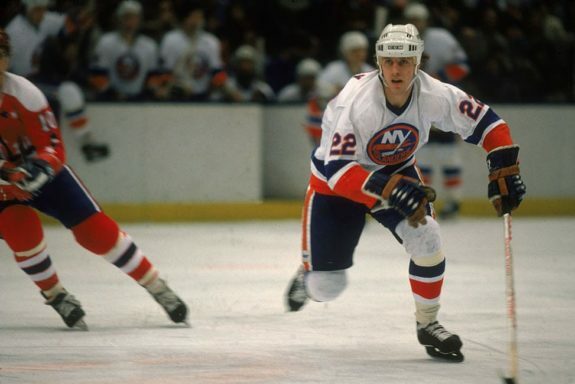 The two of them performed so well that year that Islanders superstar Mike Bossy spent a lot of time playing with them, whereas in previous seasons his linemates were Bryan Trottier and Clark Gillies. Ziggy Palffy was goalless in five games in his first season with the Islanders. In his second year – a strike-shortened season – he played in 33 games and scored 10 goals. After the NHL returned to a full schedule in 1995, he took off. Palffy’s scoring ability was on full display as he turned in three consecutive 40-goal seasons from 1995-96 through 1997-98 with 43, 48, and 45 goals. He would play one final season with the Islanders before being traded to the Kings. Pat LaFontaine’s Hall-of-Fame career included eight seasons with the New York Islanders during which he scored 287 goals. He had four seasons in a row with totals of 47, 45, 54, and 41 goals between 1987-88 and 1990-91 before becoming the centerpiece in a blockbuster trade with the Buffalo Sabres. The trade brought Pierre Turgeon, Uwe Krupp, Benoit Hogue, and Dave McLlwain to the Isles in exchange for LaFontaine, Randy Hillier, Randy Wood, and a fourth-round pick. LaFontaine went on to have three more 40-plus goal seasons with the Sabres before being traded to the New York Rangers where his career ended prematurely due to concussion issues. Pat LaFontaine scored 40 or more goals seven times in his career, including four times with the New York Islanders. Bryan Trottier is a legend. He was the number one center on an Islanders team that won four Stanley Cups in the early 1980s. He is the team’s career leader in games played (1123), assists (853), and points (1353). He is second on the all-time goal list, behind his linemate Mike Bossy, with 500 goals as an Islander. He scored over 40 goals five times in his tenure with 46 in 1977-78, 47 in 1978-79, 42 in 1979-80, 50 in 1981-82, and 40 in 1983-84. In the later stages of his career, Trottier went on to play three seasons with the Pittsburgh Penguins. He was able to add 24 more goals and win two more Stanley Cups playing behind centers Mario Lemieux and Ron Francis. Mike Bossy is one of the most talented and prolific goal scorers in NHL history. He was the second player ever to score 50 goals in 50 games and is the Islanders’ all-time leader in goals with 573. He played just 752 games in a ten-year career that was shortened by back problems, forcing him to retire at the age of 30. Bossy scored over 40 goals in the first nine of his ten seasons with the Islanders; more accurately, he scored over 50 goals four times and over 60 goals five times in those nine seasons. In his last season with the Islanders, his back problems limited him to 63 games but he was still able to score 38 goals. Over his ten-year career, he averaged an incredible .76 goals and 1.50 points per game. Together with linemates Trottier and Gillies, Bossy led the Islanders to become one of the most successful hockey dynasties in NHL history. Between 1980 and 1984 they won 19 consecutive playoff series (including four Stanley Cups) until their eventual loss to the Wayne Gretzky-era Edmonton Oilers in the 1984 Cup Final.